Ever since my visit to the Groves Grown Tropical Fruit farm which I babbled about in the Coconut Shrimp/Prawns with Spicy Thai Mango Sauce recipe I shared a couple of weeks ago, I’ve been going a little mango-mad. Mango sorbet. Mango cheesecake. 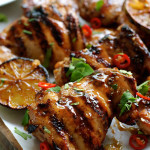 Mango marinade (seriously SO GOOD!). Mango salsas. I don’t want to overwhelm you with mango recipes so I decided to pick one more to share this summer. And really, there was no contention. This Mango Thai Red Curry. There are no words. Honestly, I think it’s the best “from scratch” invention to come out of this kitchen for a while. LOOK how thick and saucy it is! With 1/3 less calories!!! 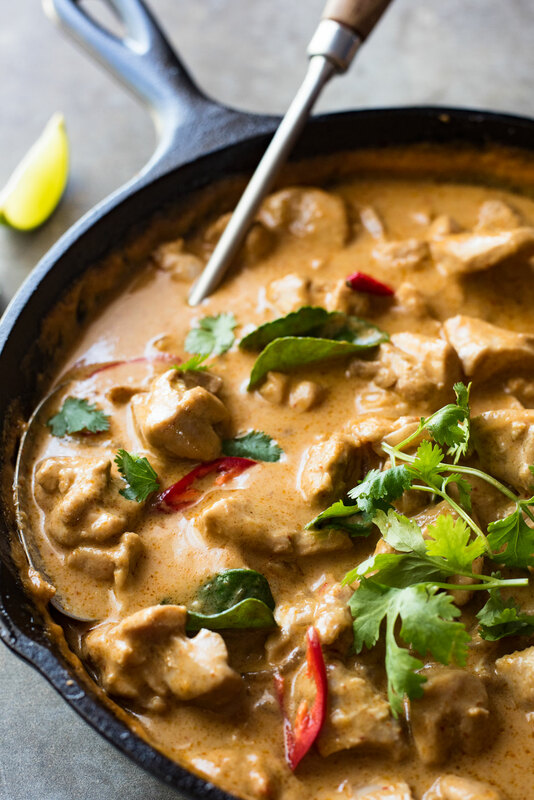 Everyone loves a great curry, especially creamy coconut milk ones. But I rarely have Thai curries midweek because of the calories….WOWZER! Coconut milk is seriously loaded with calories. There are 920 calories / 3,850 kilojoules in one 400g/13oz can of coconut milk. Did you know that?? Sure, you could go low-fat coconut milk. But it’s nowhere near the same……Those who have tried it will know exactly what I’m talking about when I say that the curry sauce is watery instead of creamy. So the awesome discovery I made?? Switch out half the coconut milk with mango puree. That’s right, mangoes! In puree form it’s thick and creamy, has the sweetness of coconut milk – the PERFECT coconut milk substitute. With less than 1/3 of the calories of coconut milk. And in case you are concerned, NO it’s not too sweet! Coconut milk is sweet anyway, so it basically replaces that. Plus, here are the ratios I use: 1 can (400g/13oz) coconut milk, 1 cup mango puree and 3/4 cup chicken broth/stock (thins out the mango, adds extra flavour depth). There is no way anyone would taste this curry and think “this is sweet”. To be clear – I did not invent this recipe in a bid to lighten up curry! 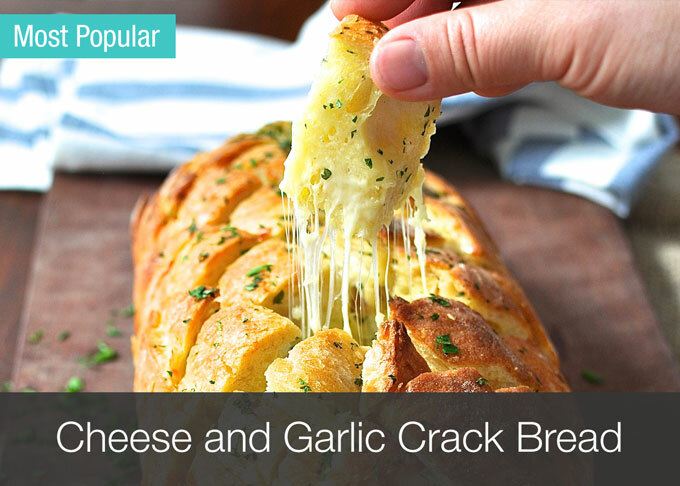 I made it simply because I thought it would be delish – and it blew me away. And my taste testers. Especially when I told them it was so much healthier than the usual red curry! This is the very first recipe I’m sharing which uses a store bought curry paste. And it’s in response to a request from a friend who mentioned that curries she makes using store bought curry paste just never tastes as good as restaurant curries. There’s no denying that a made-from-scratch curry paste makes a difference. But you know what? The bigger factor is using store bought curry paste properly – freshening up the flavours by sautéing it with onion, garlic, ginger and chillies. And the ultimate tip I have? KAFFIR LIME LEAVES. That is the key. They smell limey but are earthier, and when you plonk them into the sauce to simmer away, that is when the magic happens and you’ll make a curry that rivals a restaurant one. 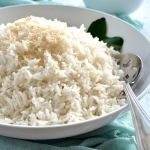 Just like it’s the secret to make a Restaurant Style Coconut Rice. I need to stop here. Otherwise I’ll write a thesis. The secrets to making a GREAT curry using store bought curry paste are: saute the paste with onion, garlic and chilli, simmer the sauce with kaffir lime leaves (KEY TIP!) and using fish sauce for seasoning. This curry is made using mango puree which is a miracle way to make a thick saucy curry but with ⅓ less calories than just using coconut milk (mangoes have ⅕th of the calories of coconut milk!). Read more in Note 2. If you don't have mangoes, you can make this with just coconut milk which is just as tasty but has more calories - see Note 3. Add curry paste and saute for 2 minutes until fragrant. Add coconut milk and chicken broth. Bring to simmer, stirring to dissolve the curry paste into the liquid. Then add the mango, fish sauce and kaffir lime leaves. Turn heat down to medium and simmer for 12 - 15 minutes, stirring occasionally, until the sauce is thickened. Adjust saltiness using fish sauce. Serve over jasmine rice, garnished with coriander/cilantro, wedges of lime and slices of red chilli, if desired. 1. 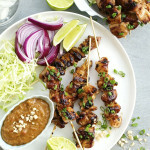 I use Maesri Red Curry Paste which you can get from Woolworths supermarket in Australia. I also use Ayam on occasion. 2. 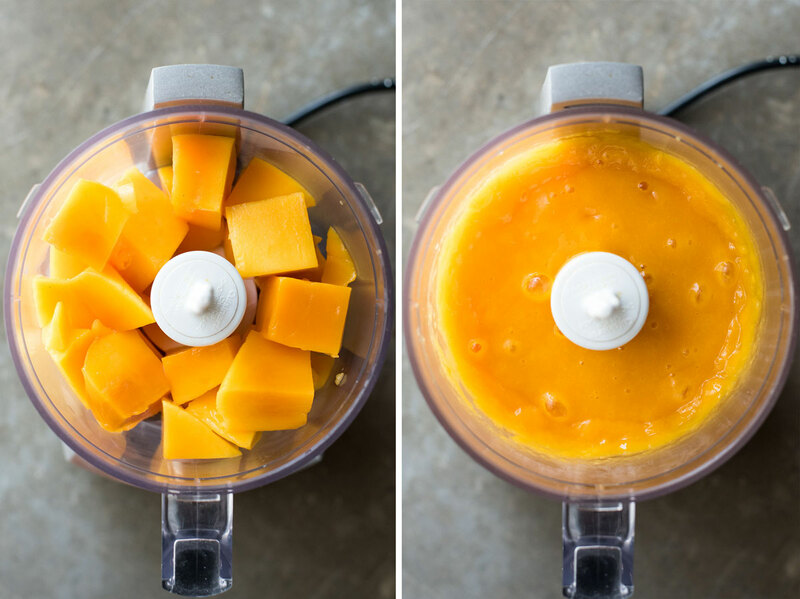 To make mango puree, place mango in a food processor of blender and whizz until smooth. A handheld stick blender can also be used. If you can't find fresh mangoes, either defrost then puree frozen mango or use canned mango (pieces, drained, or pureed). Mango juice is not suitable because it is watered down. 3. To make this with just coconut milk, leave out the mangoes and chicken broth/stock and use 1½ cups extra coconut milk (just under 1 extra can). 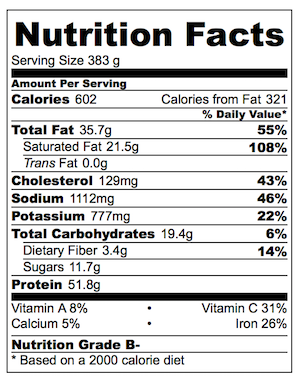 The nutrition information for this alternative is below. Nutrition per serving assuming 4 servings using MANGO puree. 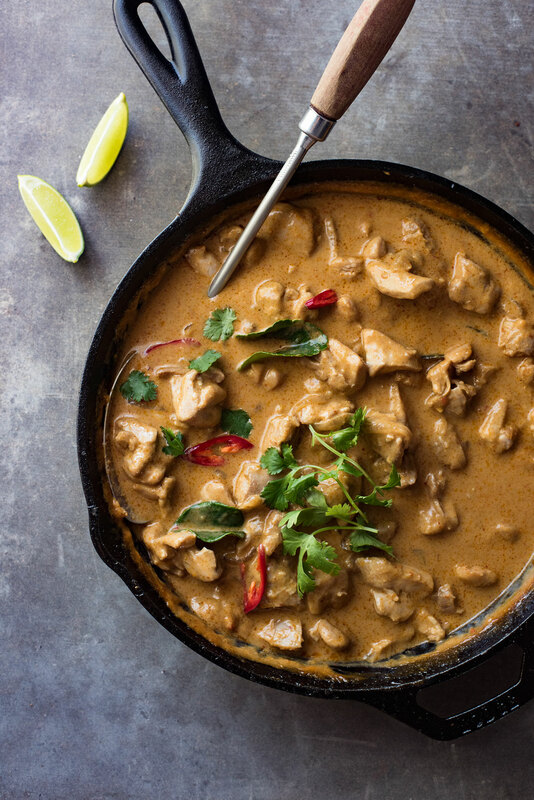 Note: This curry is saucier than most Thai curry recipes you’ll find! Nutrition per serving assuming 4 servings using only Coconut Milk per Note 3. Wow have just found you and tried this little gem last night. Like many others I was not able to find the leaves either, but last night I gave up and use lime juice and the dish was GREAT! I have some leaves on way from internet and if we loved with juice cannot wait to make again with right stuff. YAY! So glad you loved it Debb, THANK YOU! Also, this is a not related comment but I wasn’t sure where to post it. I have been trying to get right a recipe for “stir fried diced chicken with chilli and peanuts” that we get at a restaurant called Dumplings Plus here in Melbourne. I am pretty sure it’s Kung Pao chicken but none of the recipes I have tried taste right. I was wondering if you had a similar recipe or something along those lines you like? OMG!!!! I am sharing it next week!!! Yup it definitely sounds like Kung Pao Chicken if it has peanuts and chilli. Does it have a touch of sour and a bit of spiciness with a dark brown sauce? If so, YES it is definitely Kung Pao Chicken! Oooh, I do hope you try it! And I’m so glad you love my Pad See Ew, isn’t it da bomb??? I happily found your receipe for the Red Thai Curry. 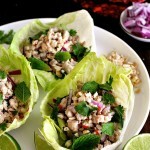 My daughter and I are both lovers of Thai food,so we will be making this receipe this week. Can you tell me where I can purchase the lime leaves? Is it possible that an oriental grocery store would have them? If I found them with spices and they are bottled dry, would that be an alternative to fresh? I look forward to your answer and future receipes. I hope to look and see if any of your receipes are in the archives. We have a lot of cooking to catch up on. Hi Nancy! I would be surprised if your Asian store did not have them! Also fruit & veg stores have them, and in fact my supermarkets have them (I’m in Australia). At the Asian store, if they don’t sell them fresh, see if they have them frozen (they freeze brilliantly). Otherwise, dried kaffir lime leaves as a last resort will work Hope you love it! It’s another recipe of yours I’m excited to try! The problem is my kaffir lime leaves have dried up because they’ve been refrigerated for months. Do you think I still can use them without ruining the dish taste? Hi Vidya! They will just be like using dried ones – I’d throw in an extra one just in case but it should work just fine! Surprisingly simple and sooo tasty – will recommend this to all my friends before the mango season is completely over. Thank you and please keep your beautiful recipies coming!!! Thank you so much for your wonderful feedback Nikki! I’m SO GLAD you enjoyed this!!! PS I went a little mad last week stocking up for winter….I froze so many mangoes! I absolutely loved this recipe – the mango added a wonderful depth to the curry. 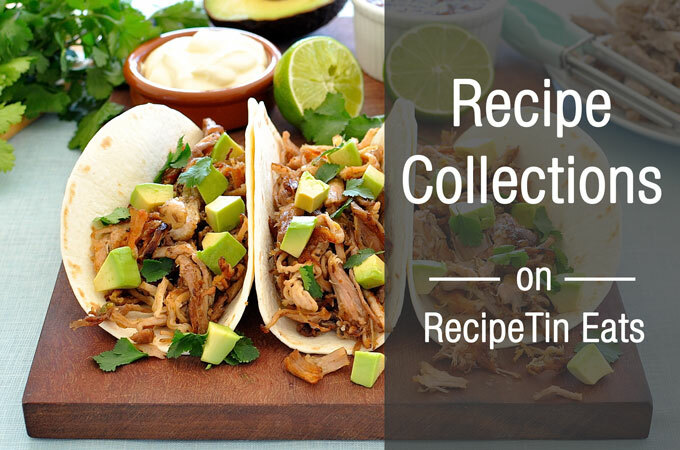 Your recipes are great and a huge success at home. I am SO SO GLAD you enjoyed this Trish! 😂 Thank you so much for coming back to let me know!! Anyway, you can just use your imagination and believe me when I tell you that it tastes good and looks good in real life, as they say. Oh, Ms Nagi, stop it. Stop with your amazing recipes and tasty tasty dishes. Stop making me want to eat until I burst. Stop making me want to dive into the glorious golden lake of red curry and drink it all up with a long straw. Stop making me lick my plate clean. Just stop it. You hear me? On second thought, don’t stop. We’ll starve in this house if you stopped. I made this red curry last night for dinner, and it was AH-MAH-ZING!!! So rich and creamy with such bold flavours and perfect umami. The mango was a stroke of genius – I loved the sweetness and the thickness the mango purée brought to this dish. The red curry paste and the chilli worked in perfect harmony with the fish sauce, and the squeeze of fresh lime over the curry and rice rounded out this most delectable concoction. 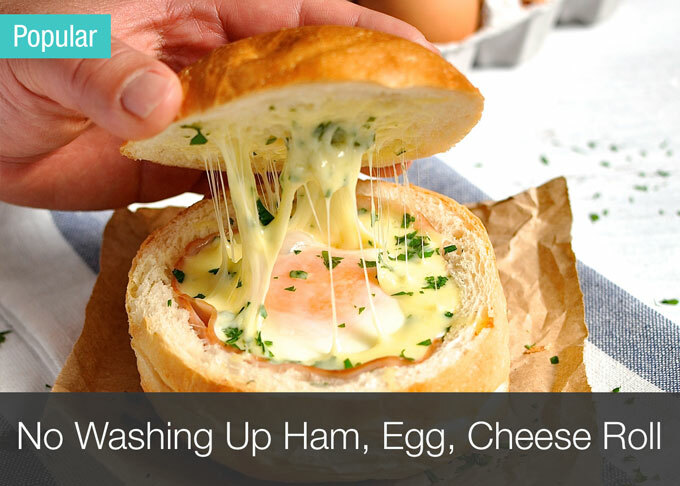 Super easy to make and so very very delicious. I added 2 cups of green beans to boost the veg content. Oh. So. GOOOOOOOOOOOOOOOOD! J Daddy and I made piggies of ourselves last night and ate ALL OF THE CURRY between us. All of it. Every last bit. With the exception of about half a cup of sauce. I will definitely be making this one again and again and again! I normally really dislike fruit in savoury dishes but I was more than happy to give this a try – and the mango is beautiful, definitely not noticeable as a fruit flavour but adding texture and sweetness to balance the curry paste and fish sauce. I threw in sugar snap peas and corn as well to pimp the veggie side of things, and also used 1kg of chicken to get 5-6 servings out of it as there is a stack of sauce. The lime squeezed over the top at the end was the icing on a very tasty Thai cake – thanks for another excellent recipe Nagi! I’m not big on fruit with meat either! In fact, I generally stay away from it full stop – I don’t even do apples with pork!!! So I totally know what you mean – and probably should have mentioned that in the recipe!! I’m so glad you enjoyed it Beck!!! I made this tonight. So lovely!!! I will be mourning the end of Mango season thank you for this recipes! They never fail! Thank you so much Anne! I will be mourning the end of Mango season too….😢 I’ve stocked up though!!! I have about 20 bags in the freezer!!!! I made this on Friday and it was so easy & absolutely delicious. I did however have a lot of sauce left over so I put it in the freezer. Now I just need to add chicken. Thank you again for a fab recipe. Hi Nagi – Well, you did it again. Every time I make one of your recipes, I’m blown away. This was AMAZING!. So so good – and now in my permanent rotation of things I must have at least once a month. The pureed mango is genius. 😂 Thank you Sheri! I can’t tell you how much your message means to me, this being a from-scratch personal invention!!! I was pretty amazed too I am a little obsessed with this!!! By the way, you cannot overwhelm us with mango recipes. More please. This looks incredible, I can’t wait to try and make this! Love trying interesting fruit-meat combos! Out of curiousity, is the nutritional info just the curry not including rice? 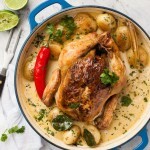 I’m making this tonight, I can not wait!!! The old thing I can’t find anywhere are the kaffir leaves.. any suggestions?? Hi Brittany! I hate to tell you this but there is really no substitute for kaffir lime leaves….BUT in the event of emergencies, I have used 1 bay leaf, and the zest + juice of one lime. It will still lovely, it just won’t be QUITE as close to the curries you get in restaurants but it will still be really delicious! I made it with the adjustments that you suggested and it was a hit. I doubled up on everything and my family inhaled this. Will definitely be adding to my favorite recipes! Thank you!! I love how you added pureed mango to this curry! It looks fabulous! Mango and kaffir lime leaves>I am so all over this! Great tips, Nagi! Who would have thought? To think I never ate a mango before I was 25 and now they are my favorite fruit. But I did grow up in Illinois! Ohhhhh….I love hearing that!!! Hey – I’m sure I have many similar!! I never had a PB&J until I was 32. And my first Reece’s was when I was in my 20’s! Seriously!!! Your creativity just never seizes to amaze me. Seriously this is beyond brilliant!!! I pride myself on making a damn good curry with Kaffir lime leaves myself Seriously the next time I make a curry I am trying this technique! Off to get your recipe….you know I adore your food. PS I know this is weird, but I am strangely obsessed with your chipotle lime popcorn cauli. It’s been a lifesaver in my attempt to be more healthy!!! Guilt free snack food! I am salivating over here big time, Nagi! I have always been a bit scared to play with spices in the kitchen, so I really appreciate your tips, especially the mango one! Thanks Mariana!!! Oooh…the mango….honestly makes such a difference! This looks amazing!! I love Thai curries, actually I love all curries but you just hit on the reason they’re not an everyday food for me. 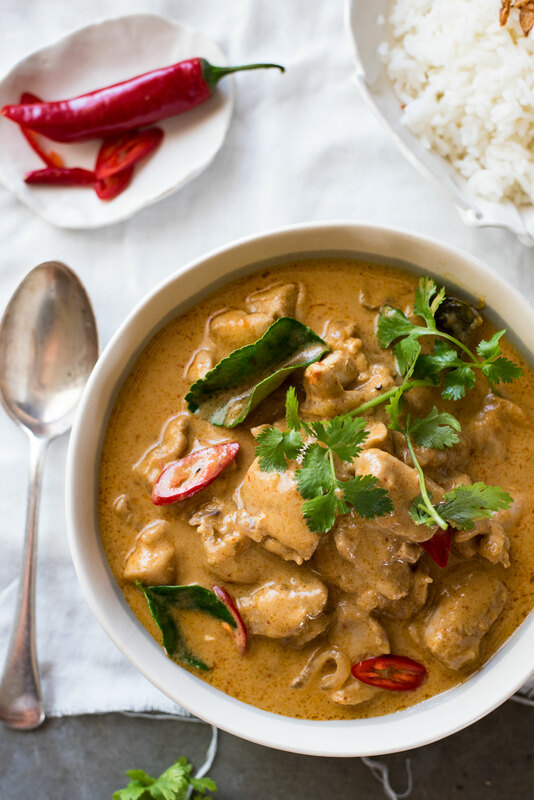 I love creamy coconut milk curries and I do know the calorie count! Anyway, I have to make this now!! Oh Nagi, I won’t rest again until I make this. It sounds SO good and I’m in need of a really good meal. Your photos always make me drool, Nagi, and this is no exception. There are several ingredients necessary for Thai cooking that I can’t get here in San Miguel, and this recipe makes me realize how much I miss this cuisine! No Asian stores in the area??? Oh wow nagi that looks absolutely amazing. I love using kaffir lime leaves but they can be hard to find. And using mango puree, genius. Now I am depressed about the cal count of coconut milk thought. It depresses me too I LOVE coconut milk!!! Can I come and live with you? I’m pretty worthless but just think of all the compliments I would give you for this dish alone. BA HA HA!!!! Let me just pop some of this in an express courier for you!! Boy! Do I ever wish I were your recipe tester!! I can’t believe how good it looks and the flavor combination is mouthwatering. YUM!! Looking forward to making this. xxxooo Thank you for the recipe. Oh now you didn’t!!!! I am so drooling over here – mango purree as coconut milk in Thai Curry???!!! Oh my goodness!!! Words fail me – maybe it’s cos all the drool is working it’s way upto my brain too! 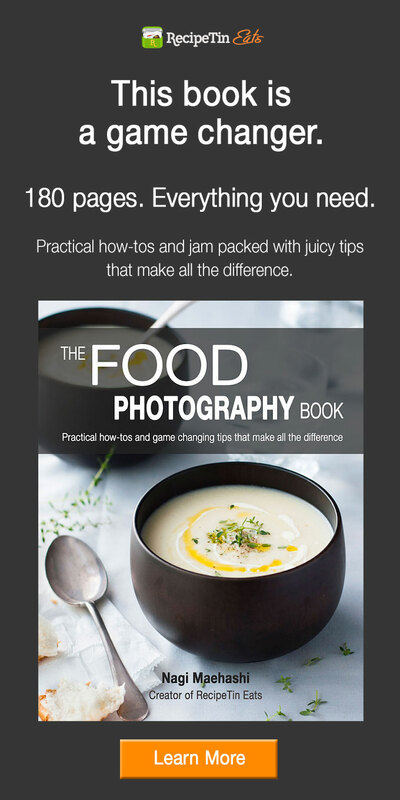 This is fantastic Nagi – I cannot wait to try this! Oh wow, this looks amazing! 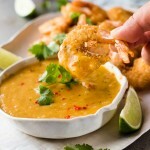 LOVE your idea to use mango puree – you have some great ideas for creamy sauces that don’t go full fat. Oh and hey, please DO overwhelm us with mango recipes!! Yum. Yum! This is going on my “make this week” list, Nagi! We love curries, and the mango is a great idea. I always have frozen mango chunks in the freezer (from Trader Joe’s) to use in smoothies. Does this recipe freeze well? I don’t see why it wouldn’t. I love to have a batch of curry on hand for a quick meal. I have some dried kaffir lime leaves though they are old. I will have to search out a new supply. Hi Marlene! Yup this freezes great actually! I tried it out! Adding mango is a genius tip, Nagi! To me, mangos have a creaminess to them so I imagine they add to the texture AND the flavor. I’m also a huge fan of Kaffir lime leaves (I think they MAKE Tom Kha Gai soup). 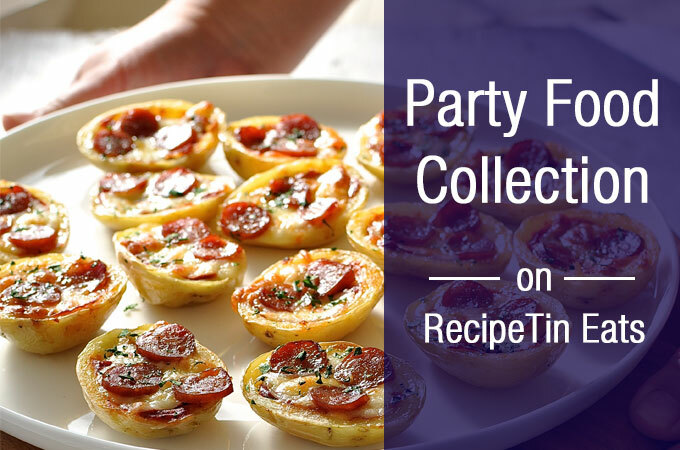 This recipe is an all around, must try show stopper!! p.s. Do you have an OXO mango pitter? It may look gimmicky, but it works like a charm! Umm – mango pitter? Hello. Where were you when I needed you? I just peeled 15 mangoes to freeze by HAND!!!! It took me ages!!! Hi Nagi! This is such a gorgeous dish, Gary would “hoover” this up in a hot minute! I’ll have to search locally for curry paste, but will probably have to go to Knoxville and visit an Asian market where I know I’ll buy way more than just that! No curry paste at supermarkets Dorothy?? I thought they were pretty mainstream everywhere nowadays!!!! OK, what in the world are you doing up so early? Looking so luscious and creamy, just like we talked about, love this! Pureeing the fruit in the sauce is a wonderful alternate. I’m making a red curry paste this morning actually. Bravo Nagi! Ba ha ha!!! Curry paste today?? What a co-incidence!!! Firstly…OH MY GOODNESS…..You will never guess what I posted on the blog today!!!!!!! We are in sync! Secondly. YES!!! Adding the mango is genius! Reduces calories, adds vitamins and I bet it tastes amazing! SO CLEVER!!!!!! I just want to reach in and steal a spoonful! NO WAY! Seriously??? Popping over to check it OUT! 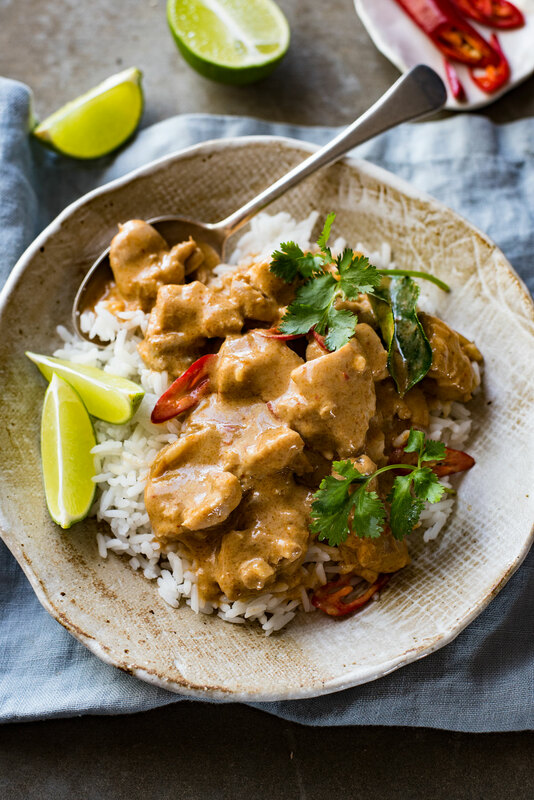 This sounds crazy good, LOVE Thai curry, I had never thought to add mango but I think its a wonderful idea and will go so nicely with the other ingredients. Thank you so much for the awesome recipe!!! Thanks Angie!!! It really does match absolutely perfectly! Can you let me know how to cook a Chinese Prawn curry. Hi Phil! I’ll pop it on my recipe-requests list!